Let’s face it; most of us style our hair in some way every morning in order to feel confident about how it looks. This could mean straightening it, curling it, or even blow-drying it. However, whatever kind of heat application you’re using on your hair, it’s important to use a heat protection product. To avoid or at least lessen the weakening effects of heat on your hair, you need to use one of the best heat protectants out there, and luckily for you, we’ve got them all right here! Let’s get started, shall we? One of the best heat protectants for dry hair, is easily the HSI Professional Argan Oil Heat Protector. HSI is one of the most reputable, well-known brands in the hair styling world, and this spray is one of their best, in our opinion. We all know that frequent blow-drying and styling can quickly lead to hair damage. You’ll begin to see some frizziness, some split ends, or just general dryness and dullness. Nobody wants that, right? In order to keep your locks looking their best while maintaining its health, you’ll need to use one of the best heat protectants. 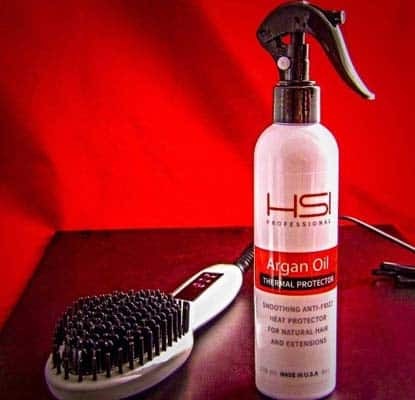 The HSI Argan Oil Heat Protector comes in a spray form, so it’s easy to cover all of your hair in a short period of time. Not at all. Especially when you take into consideration how reputable the brand is, and how long-lasting the formula is, it’s definitely a great buy. Your every-day woman to professional hair stylists alike love this product, and we have to say we’re right on board with that. Maintain smooth, soft, and hydrated hair all day long, and keep your treasured tresses protected the way they should be. The HIS Professional Thermal Protector is designed to defend hair from heat damage, all the way up to 450 degrees, Fahrenheit! That’s pretty extensive, and we found it to work for all of our heat protection needs. It not only was defensive, it was active in making sure our hair looked and felt its best. This is due to the inclusion of Argan Oil, which is an excellent moisturizer, and further helps to avoid any drying effects that often come from styling the hair. Just after one use, we felt a difference in the softness, shine, and overall health and manageability of hair. Having issues trying to find the right one for your hair type? Worry no more, as this product has been tested over and over again on all types of hair, including extensions, and works well with them all. Oh, and they’re also sulfate, phosphate, and paraben-free, which makes it safe for everyone to use! So, are there any downsides? The only real one we found, is that if used on thinner hair, too many sprays can easily cause it to look greasy. If you do have thin hair, don’t worry; it’s just important to make sure you’re only using exactly the amount you need and not overdo it. Are you looking for an eco friendly heat protectant spray that actually works to help nourish your hair while protecting it from heat damage? If so, then do yourself a favor and check out the InstaNatural Thermal Protector Heat Spray. InstaNatural is a company with humble beginnings in Florida, that works to provide natural, yet very effective skin and hair care solutions. They’ve grown quickly due to their honest business practices and putting out consistently good products, and this spray is no exception! As one of the best heat protectants for fine hair, we loved that it did not weigh down hair or make it look greasy, the way so many others do. The spray is the ultimate in heat-protecting leave-in spray that works to give you softer, shinier, and silkier hair that’s more manageable and healthy. Their formula is made with Organic Argan Oil, Castor Oil, Vitamin B5, and Sunflower Seed Oil for the ultimate in nourishment! Not only that, but if you’re looking to boost hair growth, this is the way to do it. Heat damage actually makes it really hard to grow your hair out. Because it causes split ends, frizziness, and general weakening of the hair strands. This means that before it can grow to the length you’d like, it will end up breaking, which will just cause frizzy hair that doesn’t seem to grow. If you’re sick of lifeless, dull hair, and want some volume and shine in your life, step on up! This to be honest, wasn’t our absolute favorite, but if you do have thin or oily hair, then you’ll probably love it. It’s definitely not one to weigh down the hair or make it greasy. In fact, it actually kind of dried out some of our hair, which was a bit odd. In contrast, those with thin hair absolutely loved how it made their hair look very moisturized and shiny. It does work well to protect hair against heat damage, which is its primary function, anyway. If you are trying to avoid split ends and frizziness, then this spray will help lock in the moisture that you need, while keeping it away from damage. It’s also listed at a pretty affordable price. You only need a few light sprays to get the effects, and the bottle lasts for quite a good amount of time! We also really loved the fact that it’s free of parabens, sulfates, mineral oils, formaldehyde releasers, MCI/MI, and synthetic dyes, and they are also cruelty-free! 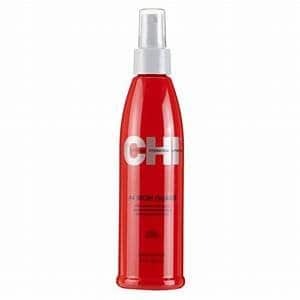 CHI is easily one of the most reputable brands in the hair styling world, and there are plenty of reasons why. They consistently put out amazing products that aren’t too expensive and last a good amount of time. 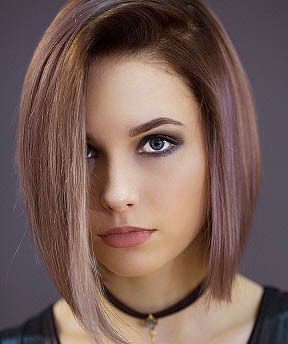 The CHI 44 Iron Guard Thermal Protecting System is a unique product which works to build the strength of the strands as well as make it resistant to heat damage from everyday styling. Through the use of proteins and thermal protecting ceramic compounds, it works to notably decrease hair damage, as well as prevent it. We’d like to say first off, that this product is a bit controversial. Some people really love it, and some people don’t. We do like it, but it wasn’t our absolute favorite. That being said, it does distribute well and you can apply it very quickly so as to not waste time in the morning getting ready. We also noticed an increase in the shine and softness, just after the first use. The reason why many didn’t like this product, is because it made their hair feel stiff or crunchy. This is typically due to applying too much product, but if you follow instructions, this won’t happen. Something else that was a bit of a downside, was the smell. It doesn’t smell bad, but it is very strong, particularly considering the fact that this is just a heat protectant spray. It is definitely not your normal scent for a product like this. Looking for a product that works well, but won’t cost you a fortune? Then look no further than the Aussie Heat Protectant. It is a heat protectant spray which is probably the least expensive that we’ve found, so far. It works to protect the hair from heat damage, while simultaneously giving life to dull/dry strands. It’s very easy and quick to apply, and will add softness and shine after just one application. To apply, simply spray after washing hair. You’ll want to make sure to leave it in, and you can dry or style the product any way you’d like. If going out to enjoy the sunshine at the beach or the pool, your locks will remain protected all day long! Aussie is a very well-known brand, and makes products for the overall well-being and care of the body. Their hairspray is a cult favorite, as it’s so inexpensive yet works wonders. With that being said, we knew we had to give the Aussie heat protectant spray a chance. We did enjoy it a lot, especially considering how inexpensive it was. The scent was pleasant, although not overwhelming like some others we encountered. It also doesn’t make your hair smell like the scent all day long; just a few minutes after application. It does work to soften the hair from root to tip, and overall makes it more manageable and less dry-feeling. We actually enjoyed applying this product, as it didn’t make our hair greasy, nor dry, and you could really feel that it was protecting the hair without leaving a weird film on the shafts. It also works great on all hair types! You can use the Aussie heat protectant on natural hair, just as well as on thin, wispy hair, and still see excellent results! That the sprayer can get a bit odd, causing it to shoot out more as a stream than an actual spray. Other than that, this is a great selection. The Tresemme Heat Protection Spray is another one of the best budget products out there, and is frequently compared to the Aussie Heat Protection Spray. There are a couple differences, however. First of all, the scent isn’t quite as pleasant with the Tresemme spray, however, it’s still a nice scent. Let’s move onto the real functions, though. This spray works to protect against heat up to 450 degrees Fahrenheit, which can be seriously damaging to our hair, no matter the hair type. It’s ideal for those who style their hair on a daily basis, or at least on a regular basis. This spray works to restore shine and suppleness, as well as working to defend against potential heat damage. Made with a moisture-locking vitamin complex, the Thermal Creations spray will leave a noticeable difference just after a couple uses. We did really enjoy the Tresemme Thermal Creations Heat Protectant Spray. The scent is very light and fresh, and you only need a couple sprays to really have it take effect. It does not make your hair greasy, nor crunchy or stiff. The one thing that you do have to be careful of, is to apply it at a distance, and not spray too much, due to the fact that the spray is rather strong! You can use it with wet hair or dry hair, but we feel that we saw better results when used on wet hair. It just felt lighter and like it had more volume. But no matter how you use it, you will see a boost in shine, softness, manageability, and health. That it is a bit messy. If you accidentally get some on the floor or countertop, be prepared for them to be slippery, so watch out for that! 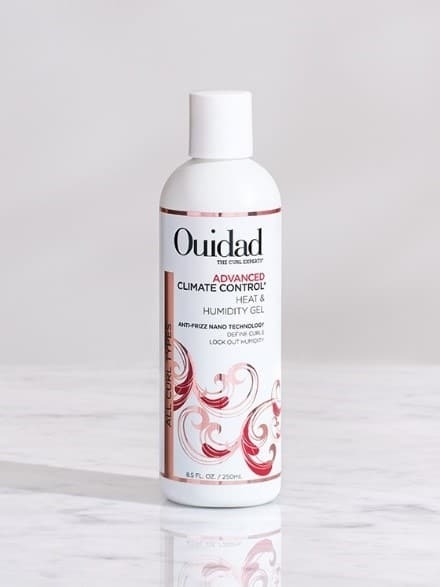 If you have curly hair, then you know how difficult it can be to style hair while keeping curls looking defined, and simultaneously protecting against heat. While it can be used to protect against the heat that comes from styling tools, but it’s mainly used to protect against the heat of the sun, as well as humidity. We know that humidity and curls together can end up being a nightmare. Curls end up expanding and start looking frizzy, undefined, and generally the curls will start to kind of lose its structure and start melding with the rest of the hair. The Advanced Climate Control Heat and Humidity Gel works to seal in moisture, while keeping humidity out. It’s made with Wheat Protein along with pliable styling polymers to create a weightless hold which works to expand as heat and humidity increases, so you don’t have to worry about it losing its hold. With the Anti-Frizz Nano Technology, it seals the cuticle as well as makes sure the hair is protected against environmental damage with the UV filter. If you have curly hair and live in heat and humidity, this is a must-buy. While it isn’t 100% effective for all users, it does make a huge difference, and you’ll absolutely notice more definition, hold, and moisture. We even noticed a bit of added shine and suppleness, which isn’t exclusively listed as a benefit of the gel, but regardless, that’s what we got. The scent is kind of odd, and smells like a type of body soap. It isn’t bad, but it just isn’t as pleasant as some other products. It only takes a little to really make a difference. The hold isn’t crazy like you’d see with your typical hair gel or spray. There’s only a tiny hint of a hold to the hair; otherwise, you won’t even notice it’s there. You will see some major definition and shine, and will no longer have to worry about heat damage! Obviously, this product is only for curly hair, so if you have straight or wavy hair, you’re probably going to want to go somewhere else. Now that you’ve had the chance to take a look at each of the best heat protectants, you may still be on-the-fence about which one to get. That’s why we’ve gone ahead and created this buying guide. We’ll make sure that you’re 100% certain about which heat protectant to get that will suit you and your needs! Which kind of form do you prefer? Typically, heat protectants come in either a serum or a spray, however sometimes they even come in a gel, and sometimes a spray can be used as a serum! Think about what you prefer. Do you like applying the products with your fingers and hands? Perhaps you don’t like getting your hands all messy and you like a spray. The advantages of a serum, is that you have more control over where the product goes, and how much you’re going to apply. A spray is quick and easy, but you are more likely to apply too much, as some sprayers act odd at times. How much are you willing to pay for your new best heat protectant spray? Think about this before you start your search, as you’re bound to find some amazing products, but you may find that they’re priced higher than what you’re willing to spend. Also take into consideration how long the product is going to last you. For example, there are many less-expensive products that may only last you a month, while a more expensive one may last you three months! We advise calculating a kind of “price per application” so you have a better idea of how much the product will actually cost you in the long run. 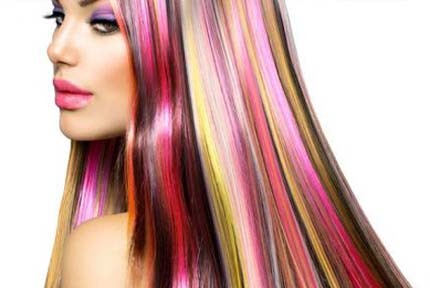 Hair type is a very important aspect to consider when purchasing any hair care product. If you have thin hair, for example, many times you’re not going to be using the same hair product as you would if you had thick, curly hair. If you do happen to have thin hair, pay special attention to the details, and make sure the product says it works well with fine hair. You don’t want to have the product weigh your hair down or make it look/feel greasy, right? 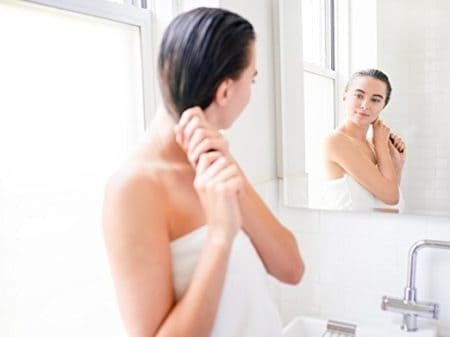 If you have oily hair, make sure the product isn’t going to aggravate that. Many heat sprays simultaneously work to hydrate the hair, and if you already have oily hair, this can make it worse. 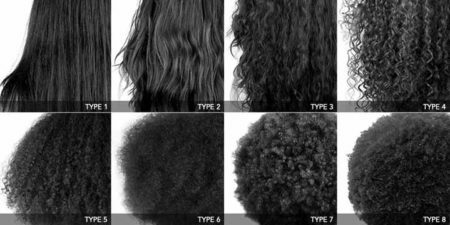 In contrast, if you do happen to have very thick, dry, and/or curly hair, make sure the product isn’t going to dry the hair out. This may sound odd, but there are actually heat protectants out there which can dry the hair out if it’s already dry or damaged. Look for something that’s going to give it more shine, life, and body! So, have you decided on the best heat protectant for your hair? 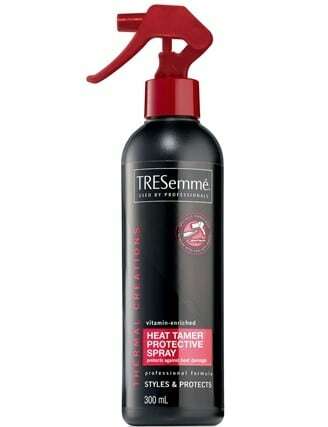 If not, allow us to reiterate how much we loved the Tresemme Thermal Creations Heat Tamer. First off, it’s extremely affordable. It will also last the typical consumer at least three months, so you don’t have to worry about buying another for a good while. It works great for all hair types, and has a practically-weightless feel to it, so it won’t weigh down hair or leave any film. It smells pretty pleasant, and will also protect your hair against any kind of heat damage, and will instead work to rejuvenate shine, body, and silkiness! So, which one of these best heat protectants will be making its way into your arsenal?